Satliva the Beard and Moochh Cream is a mix of high quality argan oil and mango butter blended with freshly extracted Indian hemp seed oil. These ingredients work together to nourish the skin, mustache and beard, promoting an improvement in overall mustache and beard health. The creamy mix softens the beard and mustache, eliminates itching and moisturises the skin preventing dry flakes. It also strengthens the hair follicles, preventing split ends, cleans the beard and mustache and promotes healthier growth. The formula is fast absorbing, lightweight and non-greasy, leaving your beard and moochh looking healthy, stylish and feeling great. 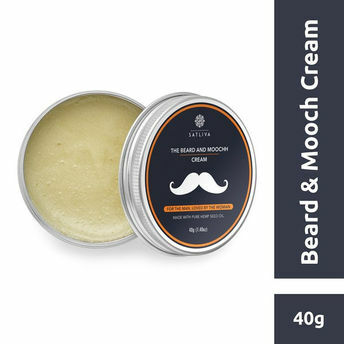 It promotes healthier growth of the beard and moochh, while deeply moisturising, conditioning and softening of the beard, moochh and the facial skin.